Skillshare vs. Lynda: What’s The Difference Between Them? You’ll find many different platforms offering online learning. Skillshare and Lynda.com are two of the most well-known ones. Skillshare is an online platform that offers around 14,000 non-accredited courses which are taught via video. The courses at Lynda.com focus mainly on helping professionals upskill. In this review, I’ll do a side-by-side comparison of the two platforms to help you decide if one of them is right for you. Both platforms offer annual as well as monthly payment plans to their users, but Lynda.com is more expensive than Skillshare. A monthly subscription to Skillshare is $12, or you can take out an annual subscription at a rate of about $8 a month. Lynda.com’s monthly subscription starts at $19.99. There’s also a premium subscription which costs $29.99 per month. Lynda.com offers no free courses, while Skillshare has a few. At Skillshare you can choose from 14,000 courses. All of them are taught in English. 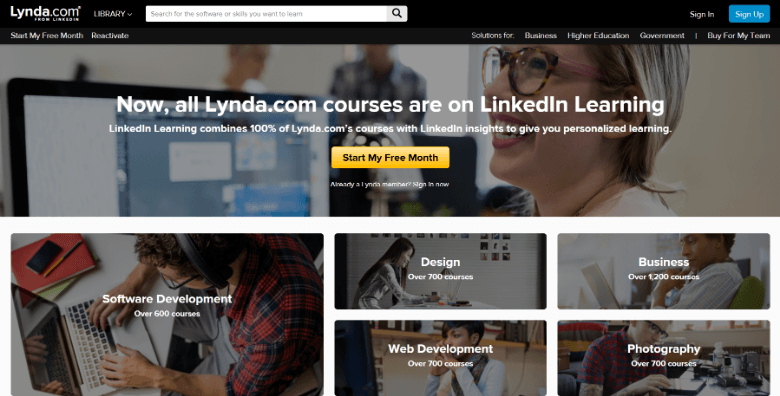 Lynda.com has more than 5,400 courses in its catalogue. You can choose from courses in English, Spanish, German and French. Both Skillshare and Lynda.com offer courses in creative subjects. However, Lynda.com also includes courses in a variety of other subjects, which Skillshare does not. It’s easy for anyone to become an instructor on Skillshare, meaning you may come across some courses that are not of the best quality. Lynda.com allows students to earn a certificate for some of its online courses, an offering that isn’t available on Skillshare. Lynda.com undoubtedly provides better quality courses to its users. The course material and all lectures must meet a certain standard, which adds credibility to the learning experience. This is not to say that Skillshare’s courses are poor quality, but there’s no guarantee that you’re receiving the best education for your money. As I touched on above, recruitment of instructors is easier on Skillshare but tougher on Lynda.com because the latter carries out a thorough screening to hire credible instructors. It’s clear that Lynda.com offers better quality courses overall. However, that’s not the only thing to take into consideration when you're choosing an online learning platform. Skillshare may offer a course you’re interested in that isn’t available on Lynda.com. Or maybe you’re on a tight budget and Skillshare’s lower cost suits you. Both platforms have their pros and cons, and the right option is entirely up to you. If neither of these e-learning options seems ideal, you might want to check out my other article where we look at sites like Udemy and other course platforms which offer online learning.